Dr. Kim McCray is a lecturer in museum studies. The newest member of the museum studies’ faculty, she joined the department in January 2017. Prior to moving to Waco, Dr. McCray completed her Ph.D. in Educational Studies at Lesley University in Cambridge, Massachusetts, while working full-time as the adult programs coordinator at Shelburne Museum in Shelburne, Vermont. Previously, she worked as Director of Interpretation and Education at the Nantucket Historical Association and as the Public Programs Coordinator at the Smithsonian Institution’s National Postal Museum. A lifelong learner, experienced museum educator, and practitioner researcher, Dr. McCray’s professional work connects theory and practice and encourages interdisciplinary, progressive approaches to adult learning and museum programs. Her domains of study include museum education, adult learning theory, and public programs. 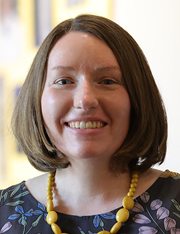 Her dissertation research explored infusing adult learning and development theory into the training/professional development of visitor guides (front-line museum educators) at Shelburne Museum. Currently a member of the Museum Education Roundtable (MER) Board of Directors, Dr. McCray is an active participant in the museum community. In addition to MER, she belongs to the American Alliance of Museums (AAM), the American Association for State and Local History (AASLH), the Texas Association of Museums (TAM), and the New England Association of Museums (NEMA). Dr. McCray is an alumna of the Seminar for Historical Administration (2010) and the Teaching Institute in Museum Education (TIME) (2015). She served as a member of the AAM 2012 National Program Committee for the Annual Meeting and as the New England Regional Representative for AAM’s Education Committee (EdCOM) Executive Board from 2011-2014. During her time at the Smithsonian Institution, she received two awards for her work: a Smithsonian Special Act Award in 2006 and a Smithsonian PRIDE (Personal Recognition for Ingenuity, Drive, and Excellence) Award in 2003.